(CNSNews.com) - Manufacturing jobs in the United States increased by 32,000 in October and have now increased by 434,000 during the presidency of Donald Trump, according to data released today by the Bureau of Labor Statistics. In December 2016, the month before Trump was inaugurated, there were 12,351,000 manufacturing jobs in the United States. In October 2018, there were 12,785,000—amounting to a gain of 434,000 over the past 22 months. 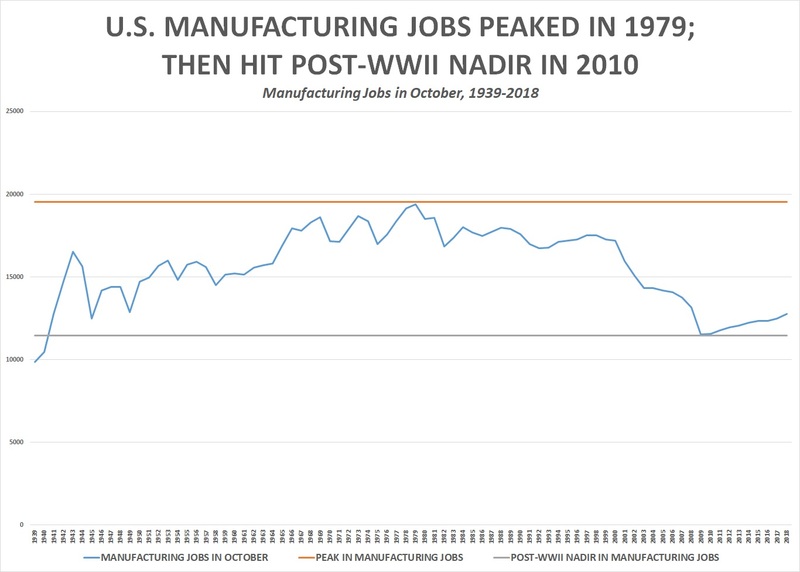 The BLS has published month-by-month historical data on manufacturing jobs in the United States going back to 1939. According to this data, manufacturing employment in the United States peaked at 19,553,000 in June 1979. It then dropped to a post-World War II nadir of 11,453,000 in February and March 2010.